How are Animals Abused and Exploited in Asia? 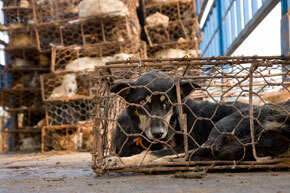 Animals in Asia are among the most abused in the world. From bears captured and caged for their 'bile', to dogs and cats slaughtered in horrific ways for their meat, exploitation of animals in Asia is common and widespread. There are far fewer laws protecting animals in Asia from cruelty and exploitation than in other continents. This makes the work of dedicated animal welfare charities in Asia like Animals Asia, even harder, as the law is often on the side of animal abusers. Animal welfare organisation, Animals Asia, started after our founder Jill Robinson, witnessed horrific animal cruelty on one of China's infamous 'bear bile farms'. But today, it works on a range of animal welfare issues facing animals in China and Vietnam. Bear bile farming is a cruel farming system designed to extract bile from the gallbladders of living bears for use in traditional Chinese medicine. 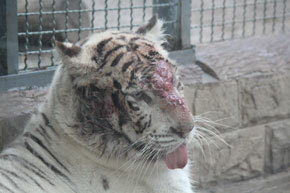 Some mammals in captivity in zoos in Asia also suffer with injury and disease. Many wild animals in captivity even self-harm due to the frustration and boredom of constant confinement. Most receive no medical care and are left to suffer alone. 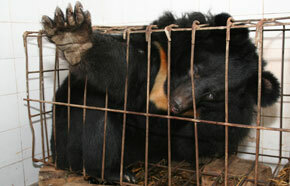 On bile farms, bears are seen as mere production units, only worth the amount of bile they produce. Animals Asia has also seen instances of old or very sick bears – those who fail to produce bile – simply left to starve to death in their cages. Bear's bile is extracted using various invasive techniques, all of which cause severe suffering, pain and infection. You can help end this horror. A gift from you today could help save a forgotten bear from a life of unimaginable abuse. Will you help? Life for millions of dogs and cats in China is dangerous. 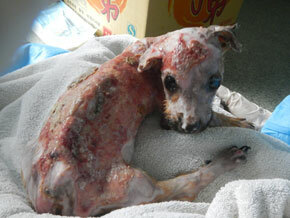 Some are abandoned pets, left to fend for themselves after being dumped by their owners. Many are strays born on the streets. Government authorities organise brutal killing campaigns in an attempt to reduce stray dog and cat populations. It's estimated that in China alone,10 million dogs and 4 million cats, are slaughtered for their meat each year. Dogs and cats of all shapes and sizes, many of them family pets still wearing their collars, are snatched from the streets and forced into tiny cages. Many suffer broken limbs as they are transported vast distances, without food or water, to meat markets. The tortuous transport and inhumane slaughter methods suffered by each and every one of these innocent dogs and cats is some of the most extreme animal abuse in Asia. 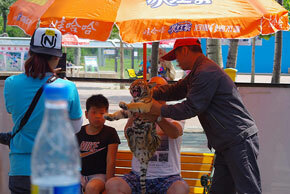 There is also widespread animal cruelty in zoos, safari parks, circuses and tourist attractions in China and Vietnam. It is not unusual to see captive wild animals in Asia's zoos in small barren cages, with no environmental enrichment, and inappropriate groupings - such as sociable pack animals housed alone. 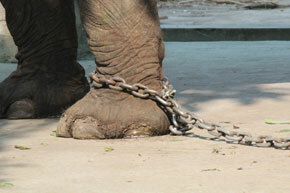 Many wild animals, such as elephants, live their lives in chains, unable to display any natural roaming behaviours, or move beyond a few metres. In many zoos and safari parks in Asia, terrified cows, donkeys, pigs, and chickens dropped into the enclosures of starving lions and tigers as live prey, for the entertainment of crowds. Many zoos in China and Vietnam, also force wildlife in captivity to entertain crowds with unnatural, degrading and stressful circus-style performances. 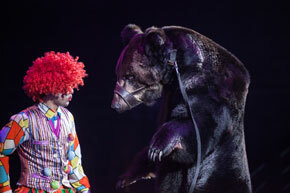 The training methods used to force the animals to perform are cruel and abusive, using punishment and fear. A number of undercover investigations into zoo performances have uncovered gross abuse of wild animals to force them to perform. Trainers will do whatever they can to break the animals' spirits. Endangered tigers and lions routinely have their teeth ripped out and are declawed to render them harmless. A recent video viewed by 10 million people in China showed a trainer kicking and beating a chained and muzzled endangered moon bear. To attract tourists and generate more profits, some zoos and safari parks use wild animals, particularly baby wild animals, as photo props. Many cubs and baby animals are removed from their mothers very young, so they can be hand reared, and held in social isolation, making it easier for the trainers to access them and force them to pose for photo opportunities. You can help end this cruelty. Could you help spare a forgotten captive wild animal from a life of loneliness and abuse? Animals Asia was one of the first animal protection organisations in China. We began rescuing bears from the cruel bile trade almost 20 years ago and today, we have saved almost 700 bears from horrendous animal abuse. 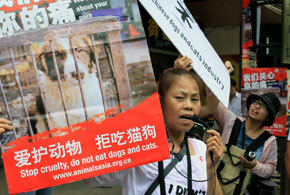 Animal rights and activism in China is on the rise. In the last decade, Animals Asia has seen the number of grassroots animal protection groups rise from 0, to over 150. Animals Asia funds a number of local animal welfare groups, who use all legal means to disrupt and whistleblow illegal dog trade activity, rescue dogs and cats from abuse, run local spay and neuter programs. Animals Asia feels that tide of public feeling is turning and attitudes towards animals in China are changing fast with dog and cat ownership at an all time high. The younger generation have been a driving force in rejecting animal cruelty and making their voices heard. In 2016, nine million people signed a government petition calling for an end to dog and cat meat eating. You can help stop this cruelty! Your support could help protect animals in Asia from unthinkable cruelty and abuse. Donate today. We all have the power to make a difference. Any gift from you, large or small, could change the life of a desperate animal forever.